They say that nothing can be certain except for death and taxes. This is only partially true -- there are far more inconveniences on this beautiful earth that you’re bound to run into. It’s a given that the pigeons are going to roost over your parking spot as soon as you wash your car. There’s no chance in heck that phone call from an unknown number isn’t someone trying to settle your credit card debt. And we guarantee you’re going to get marinara sauce on your favorite shirt when you wear it for the first time in a few months, even if you don’t eat a delicious meatball sandwich on that day. The Grim Reaper, Mr. Death himself, is one of the scariest guys on earth. Well, most of the time at least. If he showed up last weekend when we had to have dinner at our mother-in-law’s house and she started asking us what we’d name her first grandchild, we’d probably have invited him in, gotten him a beer, asked him to stay a while. Given him a big old hug. But for the most part, yes, the personification of death is pretty off-putting. 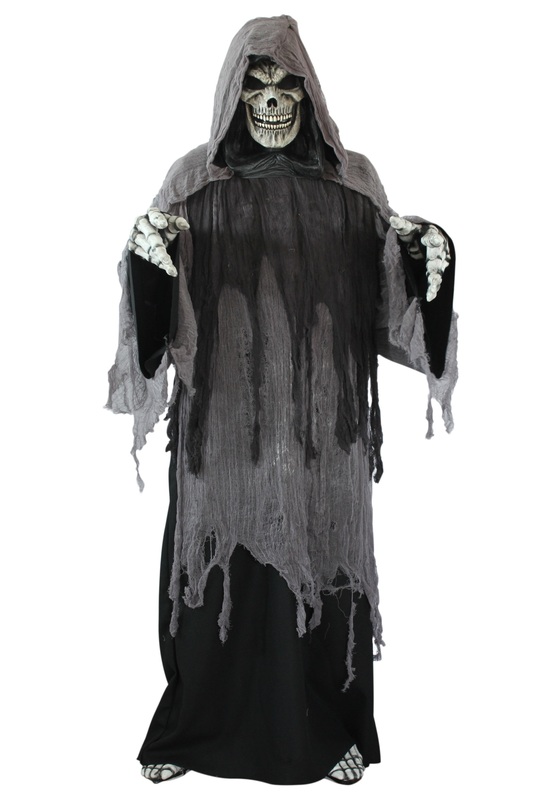 With our Grim Reaper Costume you’ll get to be the last guy anyone would want to see, and the last guy they actually will see. It comes with an absolutely sinister skull mask with meshed eye sockets for maximum spookiness. The shroud-like robe drives the whole thing home. Go solo in this ensemble and unsettle even the most courageous types without saying a word -- or team up with three pals and go as the Four Horsemen of the Apocalypse. Don’t forget to get a scythe and a bag of skulls! When else but Halloween is it acceptable to carry around a bag of skulls? Not Easter, that’s for sure. It’d make for an interesting egg hunt for the kids, though.